Here’s a list of a few runway trends for Spring 2016: Ruffles, pastoral florals, white lace, slip dresses, pouf sleeves, polka dots. And here’s a list of some of the key motifs of the Valentino Spring/Summer 2006 Haute Couture collection: Ruffles, pastoral florals, white lace, slip dresses, pouf sleeves polka dots. Everything old in fashion is new again; in Mr. Valentino’s case, everything is timeless. There’s a reason that the Spring/Summer 2006 Haute Couture is one of the Maison’s archival collections routinely raided by celebrity stylists. 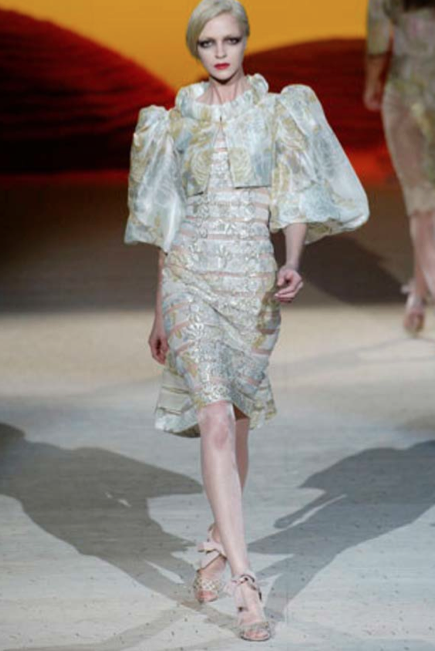 The show had a loose desert theme, one underlined by its stunning set, a vista of dunes that gave on to the catwalk. Doetzen Kroes was the first model out, wearing a sand-toned strapless gown with a skirt of tiered silk ruffles. Later in the defilé, Caroline Winberg emerged in the collection’s most iconic look: A white micro-pleated column gown of silk jersey, its vertical bias-cut frills trimmed in silver sequins. (Anne Hathaway would wear it a few years later, to Mr. Valentino’s Love Ball at Wideville.) Elsewhere, in two of her turns down the runway, Mariacarla Boscono (blond!) emerged in pouf sleeve and floral looks that you could easily mistake for ones in contemporary collections—except for the fact that Mr. Valentino’s technical prowess as a couturier has yet to be matched. Mower noted, in her review of the Spring/Summer 2006 Haute Couture, that Mr. Valentino interpreted his desert theme figuratively: He seemed, she said, inspired mainly by “the weightlessness that heat can produce.” Mower was referring to the sense of levitation in the collection, but her phrase also gets at one of the other remarkable qualities of this show. “Heat,” here, radiated from the looks’ unapologetic sexiness, a tone that Mr. Valentino always managed to strike without defaulting to the flashy or the déclassé. The Spring/Summer 2006 Haute Couture collection squares up, trend-for-trend, with a lot of the currents in fashion a decade on, but it remains unique for its way of articulating sexiness as a form of elegance. “Weightless heat,” indeed.